Skrillex is the pseudonym used by Los Angeles, California, USA musician Sonny Moore to differentiate his electronic solo work from his work with From First To Last and his other solo projects. 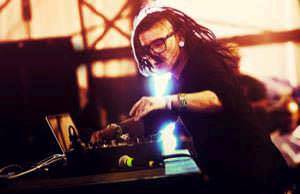 As Skrillex, Moore is an electronic DJ and producer boasting a musical style that incorporates electro house, fidget house, and dubstep. Moore began producing and performing under the alias Skrillex at clubs in the Los Angeles area in 2008. .